In an industry where every enquiry is for a unique product, the usual CRM solutions won’t tell you what products your customers and prospects are interested in. Ours can. We all know the importance of a CRM for increasing sales and delivering a great customer experience. But in the printing world, if you don’t use a CRM that’s part of your MIS, you won’t be able to use it to see the unique products your customers and prospects are interested in. 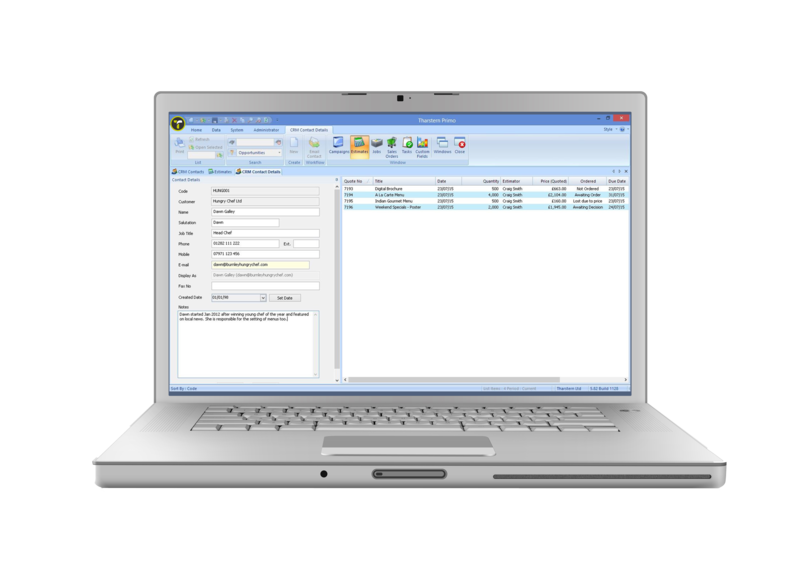 The Tharstern MIS comes with a CRM tool that allows you to filter by product type on estimates or orders. Information that your sales team can use for targeted communications and to anticipate future requirements. A recent Walker study states that by 2020 customer experience will overtake price and product as the key brand differentiator. To deliver a great experience, you need consistent and timely communications, and you need to make sure you follow up on enquiries. A CRM is critical to achieve this. So make sure your MIS has one. Tasks and notifications can be set for specific days, which will help your whole team stay organised and avoid missing follow-up actions. This isn’t just for your sales and estimating teams - it’s for everyone who uses the MIS, no matter which department they’re in. Because our CRM is part of our MIS, your sales team can focus on prospects or customers who are interested in particular products. Your sales teams, estimators and CSRs will all be working from the same application and can see what the next touchpoint should be and when.